Affordable, well-made and thoughtfully designed shopping bags that are robust enough to be used as your everyday holdall or easily folded-up and popped into your hand-bag to bring out when the need arises! A wonderful and stylish way to do your bit for saving the Environment! 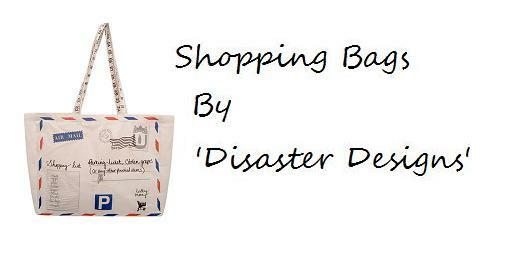 Really cute bird themed shopper from Disaster Design's 'Wagtail' range. Thick quality canvas in cream, teal and other neutral shades. The front side has flying birds with the words 'Just A Flying Visit' and on the reverse a leaf pattern with a bird motif. The shoulder straps also have pretty bird details. The bag measures 15 inches/38cm (wide) x 17 inches/43cm length. Comes with short carry handles and Long handles to allow it to be worn over the shoulder. Lovely vintage French themed shopper from Disaster Design's 'Mademoiselle' range. Thick cream canvas with navy blue, green and pink accents. 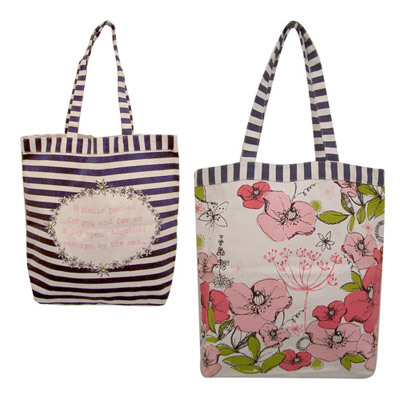 Colourful printed flowers to the front and the back reads the words 'a picnic packed for you and for me a day spent together perhaps by the sea..... The bag measures 15 inches/38cm (wide) x 14 inches/36cm length. Long handles allow it to be worn over the shoulder.